Professor Remus John Lupin, O.M. (First Class), (10 March, 1960 – 2 May, 1998), also known as Moony, was a half-blood wizard and the only son of Lyall and Hope Lupin (née Howell). He was afflicted with lycanthropy during his childhood, as Fenrir Greyback's revenge against Lyall. He attended Hogwarts School of Witchcraft and Wizardry and was Sorted into Gryffindor house. During his school years, he was one of the Marauders, best friends with Sirius Black, James Potter, and Peter Pettigrew. Together they created the Marauder's Map. After Hogwarts, Remus and his friends joined the Order of the Phoenix and fought in the First Wizarding War. However, Pettigrew betrayed James and Lily Potter to Lord Voldemort and Remus had lost all of his closest friends in various ways by the end of the First Wizarding War, though he and Sirius Black later reclaimed their friendship. Remus taught at Hogwarts School of Witchcraft and Wizardry as Professor of Defence Against the Dark Arts during the 1993–1994 school year. He was also a teacher of Harry Potter, James's son, whom he taught how to conjure a Patronus, but resigned after Severus Snape revealed to the public that Remus was a werewolf. He fought against Death Eaters once more in the Second Wizarding War, during which he lost his friend Sirius. In 1997, Remus married fellow Order member Nymphadora Tonks and had a son, Edward Remus "Teddy" Lupin. Remus fought at the Battle of Hogwarts, during which his wife was killed by Bellatrix Lestrange. Remus was also murdered by the Death Eater, Antonin Dolohov, during the same battle in 1998. He was avenged by Filius Flitwick and was the last Marauder to be killed. He briefly appeared again through the Resurrection Stone for Harry, along with James Potter, Lily Potter, and Sirius Black in 1998. Remus was born on 10 March, 1960 to Lyall and Hope Lupin (née Howell). At an early age, Remus was bitten by the werewolf, Fenrir Greyback, and he became a werewolf himself. The bite was a response to an insult from Lyall to Fenrir Greyback. His parents did everything that they could in order to try to find a cure for him, but there was none. Although he and his parents were unsure of the safety of allowing him to attend school at Hogwarts School of Witchcraft and Wizardry, the Headmaster, Albus Dumbledore, successfully encouraged him to become a student. Remus attended Hogwarts and was sorted into Gryffindor house. To secure his safety, as well as that of his peers, Remus would be brought to the Shrieking Shack once a month for his transformations in order to prevent him from attacking other students. However, this isolation caused him to attack himself out of frustration. This, and the painful monthly transformations, made the villagers of Hogsmeade mistake his screams for that of violent ghosts. Dumbledore, wanting to keep the truth of these noises a secret, encouraged these rumours. Thus, the building was dubbed the Shrieking Shack, which held the reputation for being the most haunted building in Britain. Remus became the very best of friends with fellow Gryffindors Sirius Black, James Potter, and Peter Pettigrew. He kept his status as a werewolf a secret from all of the students at Hogwarts, including Sirius, James, and Peter, his fellow Marauders and future Order members. He made up stories to explain his monthly disappearances, such as that his mother was ill and he needed to go home to visit her. He was terrified that they would desert him once they found out what he truly was. However, Sirius, James, and Peter worked out the truth during their second year, and due to their acceptance of who Remus was, and their unusually strong friendship with him, they decided to learn how to become Animagi in order to keep Remus company during his transformations, as a werewolf is only a danger to humans. By their fifth year, Sirius was able to become a dog, and James was able to become a stag, animals large enough to keep the wolfish Remus in check. Peter, meanwhile, was able to become a rat. Once a month during the full moon, Sirius, James and Peter would sneak out of the castle under James's Invisibility Cloak, transform, get into the Whomping Willow, walk down the tunnel and meet up with Remus in the Shrieking Shack. Under their influence, Lupin became tame; his body was still a wolf's, but his mind became less so when he was among them. The four of them soon left the Whomping Willow and would roam among the school grounds and Hogsmeade by night. Eventually, this group of friends came to call themselves the Marauders, and Remus' friends nicknamed him "Moony" because of his transformations during every full moon. Remus was a good student, but also a prankster. He and Peter Pettigrew would sometimes join Sirius and James in detention for mischief-making, though they did not get into as much trouble as their other friends. It's unlikely that any other Hogwarts students ever found out as much about the Hogwarts grounds and Hogsmeade as they did and Sirius, James, Remus and Peter used their knowledge of it to write the Marauder's Map and signed it with their nicknames. Unfortunately, it somehow ended up being confiscated by Argus Filch, but was eventually recovered by Fred and George Weasley in the 1989-90 school year. However, Remus' frequent disappearances riled up an unhealthy curiosity in Severus Snape, a Slytherin student whom the Marauders often bullied, in the same year as Remus. Because of Severus' enmity towards Sirius and James, he disliked Remus and Peter by association, making him all the more suspicious. He often followed Sirius, James, Remus, and Peter around in order to see what they were up to and in an effort to have them expelled. Sometime in their early school career, Sirius played a malicious prank on Snape by telling him about the Whomping Willow passageway, hoping that he would be terrified or even get seriously hurt by what he found at the other end. James, who hated Snape, was able to stop Snape and save his life in the nick of time, but Snape still uncovered Remus' secret, seeing him at the end of the passage. Remus was also a Prefect while he was at Hogwarts, although he had trouble exercising discipline over his dearest friends, he claims Dumbledore hoped he could exert control over them as a Prefect. Sirius later tells Harry that Remus wasn't an idiot like his friends because he was never cruel to Snape. But Remus admitted that he regretted that he had never stepped in to stop it. Remus: " [...] he thought I was the spy, Peter. I assume that's why you didn't tell me, Sirius?" Remus: "Not at all, Padfoot, old friend. And will you forgive me for believing you were the spy?" Shortly after graduating from Hogwarts, Remus joined the Order of the Phoenix along with Sirius, James, Peter and Lily Evans, standing up against Lord Voldemort and his Death Eaters. Remus failed to find employment following his education because of his affliction as a werewolf. However, James used his wealth to financially support him. By the height of the war, Remus' friend Sirius Black had come to distrust him, suspecting that he might be a spy for the other side. Thus, when a prophecy was made about a child who would have the power to defeat the Dark Lord, and Dumbledore identified infant Harry Potter as a possible target, Remus was not included in the plan to keep the Potters safe, though he was aware that they used the Fidelius Charm. James and Lily Potter wanted to use Sirius as their Secret-Keeper, but Sirius thought that would be too obvious, and thus suggested Peter Pettigrew instead, who would be a nearly unpredictable move, him being known for his "measly empty-headedness." Neither Dumbledore or Lupin knew of this switch. At the time of Lily and James's death, Lupin was in the north of the country on Order of the Phoenix business when he discovered what had, apparently, happened. This was one of the most traumatic events of Remus's life, especially since, within the next day, he would also be losing his other two best friends. Hermione: "No! I trusted you! And all this time, you've been his friend. He's a werewolf! That's why he's been missing classes." Remus: "How long have you known?" Hermione: "Since Professor Snape set the essay." Remus: "Well, well, well, Hermione, you really are the brightest witch of your age I've ever met." After Voldemort's first downfall, the Order of the Phoenix disbanded, and members returned to their busy lives with their families. Lupin, however, was left lonely and unhappy — his three best friends were dead, his mother had eventually died too, and he refused to spoil his father's peaceful existence by returning to live with him. Remus was forced to take jobs that were far below his level of ability, always knowing he would have to leave them before his workmates noticed the signs of his lycantrophy. By the early 1990s, Lupin was living in poverty, in a tumbledown, semi-derelict cottage in Yorkshire. Albus Dumbledore tracked Lupin down in the summer of 1993, and offered him the post of Defence Against the Dark Arts Professor at Hogwarts, replacing the permanently amnesiac Gilderoy Lockhart. Lupin only accepted Dumbledore's proposal when he explained there would be a limitless supply of Wolfsbane Potion, courtesy of Severus Snape, now the Potions Master at the school. Although the students were kept in the dark about his affliction, the staff were made aware that he was a werewolf. Remus taught the class a comprehensive curriculum of identifying and sidestepping Dark creatures such as hinkypunks and Red Caps. He also taught the class about Boggarts. It was during that class that Harry realised his "greatest fear was fear itself" when his Boggart took on the form of a Dementor. After this, Remus gave Harry private lessons in producing a Patronus as a means to repel Dementors. Incidentally, being a werewolf, Remus' boggart would take on the form of the full moon. Students who saw this boggart form mistook it for a crystal ball, except for Hermione Granger, who cleverly deduced that Remus was a werewolf and kept the discovery to herself. During his time as a Professor, Severus Snape, who had switched sides at the end of the war and became Potions Professor, provided Remus with Wolfsbane Potion, allowing him to retain his human mind during transformations. Slytherin students, encouraged by Draco Malfoy, sneered at Remus' shabby clothes and poor appearance, although he seemed to ignore their comments. Regardless, his other students held him in extremely high regard and loved the hands-on style of his classes. He was considered by Harry and his friends to have been their only decent Defence Against the Dark Arts teacher. Remus was soon summoned to Snape's office to identify whether a piece of parchment he caught Harry with to be a Dark Magic. Remus recognised it as the Marauder's Map but tried to pass it off as a product of Zonko's Joke Shop. At the same moment, Ron burst in to back up that claim. After escorting the two boys from Snape's office, Remus tells them that he knows what the map is and is more astounded that they didn't hand it in, much to their surprise. He confiscates the map, knowing that it'd be too dangerous for Harry to use the secret passages with Sirius on the loose. Enter a trunk to battle a newly procured boggart. Hermione Granger even commented in her fifth year that Lupin's exam was the only occasion where she and Harry took a Defence exam from a teacher who knew what they were doing (exams were cancelled in second year and Harry was exempt due to his status as a Triwizard Champion in fourth year). The summer before Remus began his tenure as the Defence professor, Sirius Black escaped Azkaban. Remus, like the rest of the wizarding world, had believed that Sirius had betrayed the Potters to Voldemort and murdered Peter Pettigrew. By the end of the school year, however, Remus knew the truth of what had happened and that Pettigrew was still alive, hiding in his Animagus form — Scabbers, the pet rat of Ron Weasley. He was watching the Marauder's Map, expecting Harry and his friends to go down to see Hagrid before Buckbeak's execution and was shocked to see Pettigrew coming out of Hagrid's with them. Remus was reunited with his old friend Sirius, and the two resolved to kill Pettigrew for his part in the deaths of James and Lily and in framing Sirius. They were stopped by Harry Potter, who believed it would be better to hand Pettigrew over to the Ministry of Magic to prove Sirius's innocence, and also did not think his father would want Remus and Sirius to become killers. However, that night happened to be a full moon, and Remus transformed into a werewolf, having forgotten to take the Wolfsbane Potion. Sirius was forced to turn into his dog Animagus form to protect Harry, Hermione, Ron from Remus, and unfortunately Pettigrew escaped during the chaos. After the danger had passed, Remus resigned from his position when parents learned that he was a werewolf. His sudden resignation was much to the regret of the majority of the Hogwarts students and staff, who had all grown deeply fond of him. Harry, in particular, begged him earnestly to stay, declaring that he was the best Defence Against The Dark Arts teacher that the students had ever had. Remus simply shook his head, handed him the Marauder's Map and also returned the Invisibility Cloak that was left at the Shrieking Shack, and told him that it had been a real pleasure teaching him, and that he was perfectly sure that they would soon meet again. He sent a letter to his successor informing him of what he taught Harry and the others, but it was intercepted. When Lord Voldemort returned, Remus rejoined the Order of the Phoenix. He was a member of the Advance Guard that escorted Harry Potter from 4 Privet Drive to 12 Grimmauld Place. Lupin lived for some time at Sirius's house, but he was not around very often as he was usually sent on many missions for the Order. Remus participated in the Battle of the Department of Mysteries in 1996 and defeated a number of Death Eaters including their leader, Lucius Malfoy. He was one of the only three combatants to see the end of the battle unscathed, the others being Albus Dumbledore and Harry Potter, proving Remus' exceptional skill at duelling. During this battle, Remus witnessed and was devastated by the death of his last surviving Marauder friend, Sirius, who was pushed through the veil in the Death Chamber by a curse cast by Bellatrix Lestrange. Remus barely managed to prevent Harry from diving in after Sirius, who was already lost. Later that year, Remus began working as a spy for the Order, living among fellow werewolves and trying to convince them to join Dumbledore's side. Alas, it was difficult to convince them due to the fact that many were frightened and intimidated by Fenrir Greyback . The following year, Remus fought bravely again at the Battle of the Astronomy Tower where he narrowly avoided death by a curse from Thorfinn Rowle. Remus, was devastated upon hearing about the death of Albus Dumbledore, who had been killed by Snape. However, the aftermath of the battle led to him to accept the love of Nymphadora Tonks, who pointed out that Fleur still loved Bill in spite of being attacked and scarred by Greyback. The pair attended their former Headmaster's funeral together and soon married in the north of Scotland with only witnesses from the local tavern. They were forced to do so quietly, given the general prejudice against werewolves. In July of 1997, Remus participated in the Order's operation to remove Harry from his home before Voldemort could get to him. Remus acted as the protector of George Weasley, who took Polyjuice Potion to become one of the "seven Potters." The party was ambushed by at least thirty Death Eaters, and George was accidentally struck by Snape, who was trying to aim for a Death Eater but accidentally stuck George instead with his Sectumsempra spell while George and Remus flew. Remus was unable to pay Snape back in time, it being all he could do to keep George on the broom. He eventually got the injured George back to the Burrow to be cleaned up, though George permanently lost an ear. Upon arrival, Remus accosted Harry to prove that Harry was the real Harry. It was later revealed that Snape had sent the spell in an attempt to cut off the hand of a Death Eater aiming at Remus' back, presumably about to kill him. Remus was very anxious about the late arrival of his wife; Tonks had been aggressively pursued by her murderous, cruel aunt, Bellatrix Lestrange. When the party mourned the death of Alastor Moody, they discussed their betrayal. Harry voiced the opinion that he trusted all of them with his life. Remus urged caution, seeing as Harry's father was killed because he put his trust in the wrong friend. Remus and Tonks both attended the wedding of Bill Weasley and Fleur Delacour shortly afterwards, and bravely defended the Burrow when it came under attack as Voldemort took over the Ministry. Remus suffered great mental anguish as the war escalated when he learned that his wife was pregnant. He even tore out a clump of his own hair in anxiety over the possibility that his child would be born a werewolf. He visited Harry, Ron, and Hermione while they hid out in Grimmauld Place and offered to help with their search for Voldemort's Horcruxes. However, Harry denounced him, calling him a coward for even considering leaving his wife alone while pregnant. Remus left them greatly agitated. Harry and his friends next heard of Remus on Potterwatch, under the code name "Romulus". Remus made Harry realise that they were still good friends, with his putting forth the opinion that Harry's instincts were good and they were usually right. Remus eventually came to his senses and reunited with Tonks in time to see his son born. They named him Edward Remus "Teddy" Lupin, after Tonks' father, who had recently been murdered by Snatchers after refusing to turn himself in to the Muggle-Born Registration Commission. Appearing to forgive and forget their earlier disagreement in Grimmauld Place, Remus asked Harry to be Teddy's godfather. Tonks: "Have you seen Remus?" Aberforth: "He was duelling Dolohov, haven't seen him since!" Remus was one of the many Order members who answered Neville Longbottom's call to arms on 1 May, 1998, when Harry, Hermione, and Ron returned to Hogwarts and Lord Voldemort gathered his army to attack the school. He organised and led groups to fight Death Eaters on the school grounds, along with Kingsley Shacklebolt and Arthur Weasley. His wife initially agreed not to participate in the Battle of Hogwarts, instead staying with their infant son, but was ultimately unable to bear leaving her husband to face such danger without her. She left Teddy with her mother and raced to Hogwarts, where she was informed that Remus was last seen duelling Death Eater Antonin Dolohov. Dolohov murdered Remus, who was no longer in prime fighting condition, due to months of protective and concealment charms in order to keep his wife and son safe from possible attacks. He was murdered in the Main Courtyard during the first half of the battle along with many others, including Tonks his wife, who was murdered by her aunt Bellatrix Lestrange . Lupin's death was avenged by Filius Flitwick who defeated or possibly killed Dolohov. During the brief pause in the battle, Remus and Tonks's bodies were laid out beside each other in the Great Hall. The nature of Remus' death was not revealed, but his body was described as peaceful-looking , implying that he was struck with either a Killing Curse or Dolohov's own curse; both are known to leave no visible marks on the outer body. However, Remus still had an important part to play in the war. When Harry proceeded to the Death Eater camp to be struck down by Lord Voldemort, he first activated the Resurrection Stone, bringing back the spirits of his parents, Sirius, and Remus; Remus expressed the hope that Harry would care for his son, lamenting that he would never know him, but also found comfort in the fact that his son would know and understand why he died: he was trying to make a world in which his son could live a happier life. Remus Lupin was posthumously awarded the Order of Merlin, First Class, the first werewolf ever to have been accorded this honour. The example of his life and death was of much weight on lifting the stigma on werewolves among the wizarding society. Remus is described as having a pale face with premature lines, and light brown hair that, with each book, becomes more and more grey. The lines on his face and his greying hair were the results of the great deal of stress his body underwent with each full moon. His clothing is consistently shabby and patched, presumably because of his inability to find a decently-paid job due to his status as a werewolf. In 1993, he sported a thin moustache, and from 1995 until his death, he sports more of a rough beard. He has scars cutting across his face and given Remus' comments on werewolf inflicted injuries being cursed wounds that are unlikely to fully heal after Fenrir Greyback's attack on Bill Weasley, it is possible he bears more scars from his self-inflicted injuries during his transformations. In death, however, the flaws of his appearance were rectified, just like his friend Sirius Black; his spirit was described as "younger, less shabby, and his hair was thicker and darker." Sirius: "Did you like question ten, Moony?" Lupin: "Loved it, name five signs that identify the werewolf. Excellent question." James: "Do you think you managed to get all the signs?" Lupin: "I think so. One — he's sitting in my chair. Two — he's wearing my clothes. Three — His name's Remus Lupin." Remus was compassionate, intelligent, calm, tolerant, levelheaded, brave, kind, and good-natured. To much of the world, he seemed rather shy and drawn-in. Despite having suffered a great deal of prejudice in his life due to his lycanthropy, he managed to retain an ability to see the good in almost everybody and was extremely forgiving. He also had an excellent sense of humour, and when he was a student at school, was one of the Marauders. However, unlike his friends, he never partook in bullying. He hence could be described as the most mature, responsible one of the group. He even became a prefect in his fifth year. Also, unlike his friends, he was able to, or at least would try to maintain civil conversation with those he did not get along well with, a notable example being Snape. Remus was unusually perceptive, with an uncanny ability to guess the thoughts of those around him. This is especially clear in his conversations with Harry, such as his intuiting that Harry was afraid that he thought he couldn't handle working with the boggart. He was a gifted teacher, with a rare flair for his subject and a profound understanding of his pupils. He was, as ever, drawn to the underdog, and Neville Longbottom especially benefitted from his wisdom and encouragement. True to being a Gryffindor, Lupin was quite courageous. Nonetheless, he suffered deep-seated feelings of shame and fear of rejection which, in certain situations, led him to consider backing down. His greatest weakness was that, in his desperate longing to belong and be liked, he was neither as brave or honest as he should have been at times. Remus once claimed that he was cowardly, because he was unable to bring himself to tell Dumbledore that James, Sirius and Peter were Animagi, as it would have meant that he had betrayed Dumbledore's trust, which meant everything to him. His love of James and Sirius also led him to not do anything to stop their bullying other students, a most notable example being when Snape was constantly bullied by his friends, but Remus was terrified of losing them and therefore did nothing to stop the bullying, something that he later admits to regret. Perhaps the most critical example of this was his temptation to join Harry, Ron and Hermione on Dumbledore's mission and abandon his wife and unborn son because he was afraid that her family would be ashamed of him being a werewolf. However, ultimately he came to his senses. He also has been noted to dislike the form of his Patronus as it takes the shape of a wolf. Lupin is disgusted by all things wolfish as they remind him of his condition, and due to this has been known to deliberately cast a non-corporeal patronus, particularly when in the company of others, for fear it would give him away as a werewolf. His Boggart is a full moon, possibly reflecting on an apparent terror of transforming near humans. This terror may stem from the time where Severus Snape was nearly bitten by him in his werewolf form. Remus was an accomplished and skillful wizard with extensive knowledge of Dark creatures. Harry Potter and his friends also commented that he was the best D.A.D.A. teacher, they had ever had, a testament to his skills, knowledge, and his ability to effectively impart them to younger generations. Defence Against the Dark Arts: In 1993, Remus took the position of Defence Against the Dark Arts Professor at Hogwarts School of Witchcraft and Wizardry, and was considered to be the best in this position by many of his students. It has been implied that his particular speciality in Defence is, ironically enough, against Dark Creatures. However, this is based on what he taught the third year students and may not reflect the full range of his knowledge and expertise. He also taught Harry Potter the highly advanced Patronus Charm, which Remus himself must have mastered at a relatively young age, at least when he joined the first Order of the Phoenix. Remus's Patronus takes the form of a wolf, a reflection of his condition, but he can disguise it into a non-corporeal form to hide that fact. Non-verbal and wandless magic: While on the Hogwarts Express in 1993, Remus conjured fire, (possibly Bluebell Flames) without using a wand and non-verbally. He could also open locks and chests and relight candles with just the wave of his hand. When Remus and Harry had a heated argument in 1997, Remus struck him with a silent spell so quickly that Harry barely had time to reach for his own wand. Both wandless and non-verbal magic are very difficult, indicating Remus' magical power and skill. Duelling: Remus was a highly talented duellist. During the Battle of the Department of Mysteries, he was the only fighter besides Albus Dumbledore and his pupil Harry who was not wounded, killed, or incapacitated and he may have defeated the Death Eaters leader Lucius Malfoy in the process. He also came out of the Battle of the Astronomy Tower and the Battle of the Seven Potters unscathed, even though he had to support an injured George Weasley while fighting and flying during the latter conflict. Remus was able to survive the Battle of the Seven Potters even though he had several Death Eaters attacking him, though it should be noted that during the battle Severus Snape, who was secretly on Remus' side, attempted to protect him from one of the Death Eaters. However, Remus was killed in a duel during the Battle of Hogwarts with Antonin Dolohov, a highly skilled and dangerous Death Eater, who had previously defeated very talented wizards such as Alastor Moody and the Prewett brothers, though chances are he put up an excellent fight. Charms: Remus appears to have been talented with Charms from a young age: he, James Potter, Sirius Black, and Peter Pettigrew managed to create the magically complex Marauders' Map as teenagers. He was also able to cast a corporeal Patronus (form of a wolf), which is regarded as very advanced magic and a sign of superior magical ability. Healing magic: In the spring of 1994, Remus used a healing spell to bandage and splint broken bones. He used it on Ron Weasley to support Ron's broken leg. Transfiguration: Remus, along with Sirius Black, was able to perform Untransfiguration to force Peter Pettigrew to change into his human form (Pettigrew's Animagus form was a rat). He was also able to use conjuration an advanced form of Transfiguration. In 1994 he conjured chains to bind Peter Pettigrew to Ron Weasley. Flying: Remus was a good flyer as seen when he escorted Harry with the rest of the Advance Guard from the Dursley's house. He was a skilled enough flier to be able to evade and duel Death Eaters while supporting an injured George Weasley during the Battle of the Seven Potters. Wand: Like most witches and wizards it can most likely be said that Remus's wand was among his most valued possessions and that he most likey purchased it at the age of eleven from Ollivanders. His wand was 10¼ inches, Cypress wood, and with Unicorn hair core. Cottage: In 1993 Remus lived alone in Yorkshire, England. Albus Dumbledore tracked him to this cottage and offered him the post of Defence Against the Dark Arts teacher at Hogwarts School of Witchcraft and Wizardry. The extent of Remus' relationship with his family is unknown, aside from how adored he was by his parents. During Remus' youth, his father offended Fenrir Greyback, causing Greyback to attack Remus, when he was merely four years old. Mr. and Mrs. Lupin are known to have been concerned over Remus being a werewolf, believing that this condition meant their son would be unable to attend Hogwarts. However, this was proven untrue. Tonks: "I don't care either, I don't care! I've told you a million times [...] "
Remus: "And I've told you a million times, that I am too old for you, too poor....too dangerous...."
Molly Weasley: "I've said all along you're taking a ridiculous line on this, Remus." Remus: "I am not being ridiculous. Tonks deserves somebody young and whole." Arthur Weasley: "But she wants you. And after all, Remus, young and whole men do not necessarily remain so." Remus and Tonks came to know each other as members of the Order of the Phoenix during the Second Wizarding War. Remus, so often melancholy and lonely, was first amused, then impressed, then seriously smitten by the young witch. He had never fallen in love before. If it had happened in peacetime, Remus would have simply taken himself off to a new place and a new job, so that he did not have to endure the pain of watching Tonks fall in love with a handsome, young wizard in the Auror office, which was what he expected to happen. However, this was war; they were both needed in the Order of the Phoenix, and nobody knew what the next day would bring. Remus felt justified in remaining exactly where he was, keeping his feelings to himself but secretly rejoicing every time somebody paired him with Tonks on some overnight mission. It had never occurred to Remus that Tonks could return his feelings because he had become so used to considering himself unclean and unworthy. One night when they lay in hiding outside a known Death Eater’s house, after a year of increasingly warm friendship, Tonks made an idle remark about one of their fellow Order members ("He’s still handsome, isn't he, even after Azkaban?"). Before he could stop himself, Remus had replied bitterly that he supposed she had fallen for his old friend ("He always got the women."). At this, Tonks replied: "You’d know perfectly well who I’ve fallen for, if you weren’t too busy feeling sorry for yourself to notice." Remus’s immediate response was a happiness he had never experienced in his life, but this was extinguished almost at once by a sense of crushing duty. He had always known that he could not marry and run the risk of passing on his painful, shameful condition. Wiser than Remus, she was sure that he loved her, but that he was refusing to admit it out of mistaken nobility. However, he avoided working with her, barely talked to her, and started volunteering for the most dangerous missions. Tonks became desperately unhappy, convinced not only that the man she loved would never willingly spend time with her again, but also that he might walk to his death rather than admit his feelings. Inspired by Fleur Delacour’s protestation of enduring love for Bill Weasley, who had been savaged by Greyback, Tonks made a brave, public declaration of her feelings for Remus, who was forced to admit the strength of his love for her. In spite of continuing misgivings that he was acting selfishly, Remus married Tonks quietly in the north of Scotland, with witnesses taken from the local wizarding tavern. He continued to fear that the stigma attached to him would infect his wife and wished for no fanfare around their union; he swung constantly between elation that he was married to the woman of his dreams and terror of what he might have brought upon them both. When she became pregnant, Remus was not delighted by this, he was in fact scared that he might be passing his condition on to an innocent child. He even attempted to abandon his pregnant wife and unborn child, but was stopped by Harry Potter. Realising the importance of staying with his family above all else, he returned to Tonks, bitterly ashamed. Lupin and Tonks both died in the Battle of Hogwarts in May 1998, leaving their son behind in the care of his maternal grandmother, Andromeda Tonks, and his godfather, Harry Potter. Teddy was raised by Andromeda, but would spend a great deal of time with the Potter and Weasley families growing up. Teddy was a Metamorphmagus, like his mother. Remus' son was born in 1998. Remus and his wife, Nymphadora Tonks, named him Teddy, after Tonks's father. At one point, Remus nearly abandoned his wife and unborn son, mostly out of premature shame, guilt, and the fear that his lycanthropy would be passed on and that he'd made outcasts out of Nymphadora and their child. Rather than wanting to face his impending fatherhood, he intended to help Harry, Ron, and Hermione with their mission of destroying Voldemort's Horcruxes (though he was actually unaware of what their "mission" entailed). Harry was, however, upset with the development and got into a rather heated argument with Remus that ultimately convinced him that the best course of action would be to support his family. He returned to his wife shortly thereafter. Teddy was eventually born and despite his earlier fears and insecurities about being a father, Remus expressed joy at his son's birth and asked Harry to be Teddy's godfather. Sadly, Remus and his wife were killed at the Battle of Hogwarts, leaving Teddy an orphan when he was between two weeks and one month old. When Remus appeared again through the Resurrection Stone, he was rather devastated knowing that Teddy would have to grow up without either of his parents, but found some solace in knowing that Teddy would be living in a better world. Teddy was raised by his maternal grandmother, but he spent significant time with his godfather Harry Potter's family and the Weasleys. As a Hogwarts student, Remus became good friends with fellow Gryffindors James Potter, Sirius Black, and Peter Pettigrew. In their second year, Remus' friends figured out that he was a werewolf; instead of shunning him, as many in the wizarding world would have, they learned how to become Animagi by their fifth year to accompany Remus on his monthly transformations, preventing him from hurting himself. Because he was grateful to his friends, Remus cut them a lot of slack; despite being dismayed by their bullying of Severus Snape, he did not attempt to stop them. Though he was his house's prefect, Remus had difficulty trying to curb his friends' mischievous behaviour. However, Remus was not without a mischief-making streak himself, contributing to the invention of the Marauder's Map. At some point, after Remus and his friends had all become members of the Order of the Phoenix, Sirius came to distrust Remus, fearing he might be a spy; the reasons for this are unknown. Sirius' distrust ensured that Remus was unaware when James and Lily changed their Secret-Keeper from Sirius to Peter, and thus he believed that Sirius had betrayed them when they were murdered by Lord Voldemort. The two reclaimed their friendship after Sirius escaped from Azkaban in 1993, and Remus learned the truth. They planned to kill their traitorous former friend Peter, but were stopped by Harry Potter. Remus and Sirius both became close to their late friend's son, and Remus was devastated when Sirius was killed in the Battle of the Department of Mysteries. The ending of the three Marauders who had stayed true to their friendship to the very end — James, Sirius, and Remus — was bittersweet: they all lost their lives to the two wizarding wars but were likely reunited in the afterlife,. Remus: "Severus, you’re making a mistake. You haven't heard everything — I can explain — Sirius is not here to kill Harry —"
Snape: "Two more for Azkaban tonight. I shall be interested to see how Dumbledore takes this... He was quite convinced you were harmless, you know, Lupin...a tame werewolf —"
Remus: "You fool. Is a schoolboy grudge worth putting an innocent man back inside Azkaban?" At some point in their fifth year, Snape saw Madam Pomfrey leading Remus to the passageway on the full moon; Sirius thought it would be entertaining to inform Snape of how to freeze the Whomping Willow. Snape tried to do so, but was stopped by James before he could reach the Shrieking Shack, where Remus had transformed. Albus Dumbledore forbade Snape from revealing Remus' condition to anyone, and Snape deeply resented being put in James's debt and suspected that Remus might have been in on the dangerous prank. As adults, Remus and Snape were civil to one another, although barely so on the latter's part. Remus claimed that he neither liked nor disliked Snape; of course they would never be bosom friends, after all that happened in their school days, but he also never forgot that Snape dutifully made him the Wolfsbane Potion, and made it perfectly every time so that he would not have to suffer at the full moon as he usually did. (Also, Snape secretly saved Lupin's life in Battle over Little Whinging). Snape, on the other hand, barely concealed his bitterness in their interactions. He was irked that Remus obtained the position of Defence Against the Dark Arts professor at Hogwarts, which he had always wanted for himself. He suspected that Remus was helping Sirius get into the castle and tried to convince Dumbledore to stop trusting him. Snape also took to dropping hints that Remus was a werewolf to students, which was understood by at least one of them (Hermione Granger, who kept the discovery to herself). When Remus tried to inform Snape of Sirius' innocence, Snape refused to hear or believe any of it, and was determined to see Remus punished alongside Sirius. When Snape's old enemy escaped re-capture, Snape vindictively exposed Remus' werewolf status, which forced him to resign. Remus: "It comes down to whether or not you trust Dumbledore's judgement. I do; therefore, I trust Severus." Harry: "But Dumbledore can make mistakes. He says it himself. And you — do you honestly like Snape?" Remus: "I neither like nor dislike Severus... We shall never be bosom friends, perhaps; after all that happened between James and Sirius and Severus, there is too much bitterness there. But I do not forget that during the year I taught at Hogwarts, Severus made the Wolfsbane Potion for me every month, made it perfectly, so that I did not have to suffer as I usually do at the full moon... I must be grateful." Remus met Lily Evans while they were both attending Hogwarts School of Witchcraft and Wizardry. Lily was not on good terms with two of Remus' dearest friends, James and Sirius, but that did not mean she disliked Remus as well, given that he acted more mature and thoughtful than his friends, and did not participate in their bullying though he did nothing to stop them either. Remus and Lily were both made prefects during their fifth year, and they were friendly towards each other. After Hogwarts, Lily married James Potter. Although Sirius was the best man, Remus probably attended their wedding, too, given his status as one of their dearest friends. They all became members of the Order of the Phoenix, during the First Wizarding War, and fought in several battles together. When Pettigrew betrayed the Potters to Voldemort, resulting in the tragic deaths of James and Lily, Remus was devastated. Later on, he became close to Lily's son, Harry, both as a paternal figure and a mentor. After Lupin was murdered during the Battle of Hogwarts, they were two of the four spirits whom Harry summoned. Remus met Harry Potter, the son of his late friends James and Lily Potter, for the first time since he was an infant, in 1993 when he saved Harry from Dementors on the Hogwarts Express. Remus was the Defence Against the Dark Arts professor at Hogwarts during Harry's third year, and quickly became his favourite professor. The two bonded very closely. Remus found Harry to be; intelligent, kind, and an excellent Seeker, and had strong empathy for the pain that he had experienced throughout his life. Harry admired and cared about Remus even after he found out that he was a werewolf. Remus also told Harry that the first time he saw him, he recognised him not by his scar, but by his eyes, which so closely resembled Lily's. It is suggested that Remus' classes were how Harry discovered his remarkable talent for Defence Against the Dark Arts. He took Harry aside to teach him the Patronus Charm, assisted him in avoiding trouble with Professor Snape, and returned the Marauders' Map to him once he was no longer a professor. The two met again in the summer of 1995. Remus was part of the group of Order members who transported Harry from Privet Drive to 12 Grimmauld Place. Throughout the years, Remus shared with Harry many stories about his parents and godfather. He comforted Harry over Sirius's death and also offered him advice on other occasions. The only real disagreement they ever had was when Harry rejected Remus' offer to accompany him and his friends on the quest for Horcruxes. Harry became angry and cutting; he told his former teacher that he was being selfish and irresponsible for leaving his wife and unborn child. Remus responded with uncharacteristic violence and stormed out of the house, taking refuge in a corner of the Leaky Cauldron, where he sat drinking and fuming. However, after a few hours’ reflection, Remus was forced to accept that his former-pupil had just taught him a valuable lesson. James and Lily, Remus reflected, had stuck with Harry even unto their own deaths. His own parents had sacrificed their peace and security to keep the family together. When Remus' son Teddy Lupin was born, he asked that Harry be the boy's godfather, and after Remus' death Harry played a prominent role in Teddy's life. Remus was one of the spirits that came out of the Resurrection Stone to speak to Harry as he walked to what he believed was his death, indicating the almost familial bond between Remus and Harry. In Fantastic Beasts and Where To Find Them, Harry wrote in the werewolf section "aren't all bad", showing that Remus being a werewolf did not bother him at all. Ron: "You shouldn’t have said that stuff to Lupin." Hermione Granger and Ron Weasley were among the students who were very impressed by Remus' teaching when he was professor of Defence Against the Dark Arts for their third year. Hermione deduced that Remus was a werewolf early in the year, but kept this discovery to herself, not even telling her best friends; this is likely because she disapproved of the prejudice against werewolves and knew exposing the truth would hurt Remus. Although Ron initially reacted with fear to the revelation that Remus was a werewolf, he continued to admire and like Remus. In turn, Remus was fond of Ron and Hermione, and was particularly impressed by the latter's cleverness. Ron and Hermione were shown to be very trusting of Lupin; when he appeared at Grimmauld Place, they lowered their wands as soon as he declared his name, something he reproached them for, "speaking as their former Defence Against the Dark Arts teacher." Also, they both disapproved when Harry yelled at Remus for leaving his wife during her pregnancy, although they did not entirely disagree with Harry's reasoning. Albus Dumbledore was considered by many to be the greatest wizard of all time, and Remus Lupin was among his many admirers and staunch supporters. Dumbledore was Remus' Headmaster during his time at Hogwarts. Dumbledore accepted Remus into his school despite knowing his being a werewolf, as he valued Remus' strength of character and ability, and disregarded the stigma associated with his condition; the headmaster personally approached the Lupin family to invite Remus to school, knowing full well of the circumstances. In fact, it was Dumbledore who, by several special precautions, ensured that Remus' werewolf status was kept secret during his school years, effectively preventing him from being ostracised from his school mates. When Severus Snape found out what Remus truly was due to a cruel prank played on him by Sirius, Dumbledore was the one who swore him to secrecy. On his part, Remus confessed that Dumbledore's trust and exceptional kindness towards him meant everything to him, given that the vast majority of the wizarding world shunned him because of the deep prejudice towards werewolves, and Remus felt guilty for betraying this kindness by allowing his three Marauder friends illegally become Animagi and roaming wild during their schooling years. Dumbledore was also the founder and leader of the Order of the Phoenix, an organisation that Remus joined after graduating from school, and he was trusted with many important missions. Remus was given the position of Defence Against the Dark Arts Professor at Hogwarts during the 1993–1994 school year, during which time Dumbledore requested that Snape brew the Wolfsbane Potion for Remus monthly; this, along with providing Remus with a paid job when he was suffering in poverty due to his condition, made Remus respect Dumbledore even more. Remus and Dumbledore fought alongside one another during the Battle of the Department of Mysteries, where they suffered a devastating loss: Sirius, one of their dearest friends, died at the hands of Bellatrix Lestrange. Remus told Harry Potter on several occasions that he trusted Snape because Dumbledore did so. In 1997, Remus was devastated by Dumbledore's death after the Battle of the Astronomy Tower, and demonstrated his loyalty and faith to Dumbledore by fighting and tragically dying in the next year's Battle of Hogwarts. Remus was always friendly with the Weasley family. He knew Arthur Weasley since the First Wizarding War, and they became friends again after Dumbledore led the second Order of the Phoenix. Arthur and Remus fought together at the Battle of the Seven Potters, where the latter was paired with Arthur's son, George. He saved George's life, as George would have fallen off his broomstick when he was cursed by Severus Snape. Arthur later thanked him for taking care of his son. Remus also lived for some time with the Weasley family at 12 Grimmauld Place. There, Remus agreed with Molly not to tell Harry much about the Order of the Phoenix and Voldemort's plans. However, when Sirius argued with Molly, Remus didn't take either side. Bill and Remus seemed to have been friends, as they fought together in several battles of the Second War; they were also the ones who attempted to find Mad-Eye's dead body after the Battle of the Seven Potters. After the war, Remus and Tonks's son seemed to have a romantic relationship with Bill and Fleur's daughter. Fred and George Weasley were also friends of Lupin. They were Lupin's students during their fifth year at Hogwarts and they also fought together at the Battle of the Seven Potters. Remus protected George from being killed; however, George's ear was accidentally cut off by Severus Snape. Lupin and the twins also appeared on the underground radio program Potterwatch and spoke to the wizarding community during the last year of the war. Both Fred and Lupin were killed during the Battle of Hogwarts. He was also friends with Ginny. He first met her at Hogwarts Express, saved her from the Dementors and gave her chocolate and comforted her, and she stated that he was one of her favourite professors at Hogwarts. They fought on the same side at the Battle of the Department of Mysteries and survived the battle. After the war, Ginny and the rest of the Potter family shared a close relationship with Teddy Lupin, who came to Ginny and Harry's house for dinner four times a week. His relationship with Percy was almost unknown. When Lupin was Defence Against the Dark Arts professor, Percy most likely thought he was a good teacher. They met each other again during the Battle of Hogwarts, when Percy told his family that he had left the Ministry and wanted to join the Order, though there would hardly have been time for the two to become close. When Lupin was a student at Hogwarts, the professors seemed to like him, especially Minerva McGonagall, who had been his head of house. His professors probably considered Lupin a skilled wizard and a very good student, as he was made a prefect in his fifth year. When Lupin became a professor, the other professors appeared to like and respect him, with the exception of Severus Snape. They either did not mind that he was a werewolf or did not show it, as they had been informed of his condition. Minerva even made reference to Lupin's evaluations on Harry's Defence Against the Dark Arts skills during a Careers Advice session. Many of them later fought alongside Remus at the Battle of Hogwarts. Many of the students, including Harry Potter, Hermione Granger, Neville Longbottom, Dean Thomas and the Weasleys, liked him, while others, such as Draco Malfoy and several other Slytherins, disliked and regularly insulted him. Malfoy underestimated Lupin because of his poor-looking appearance. However, Lupin managed to be well-respected (and one of the best-liked professors), as he treated all the students based on their character, and not by their magical abilities, their blood status, or their wealth. When he left Hogwarts, many students continued to regard him as the best Defence Against the Dark Arts teacher they had. Remus had a good relationship with the most of the Order of the Phoenix. In addition to Albus Dumbledore, Harry Potter, the Marauders, Lily Evans, Nymphadora Tonks, Hermione Granger, the Weasley family and Minerva McGonagall, he was friends with many of members. One of his friends through the order was Kingsley Shacklebolt. They fought together in several battles of the Second Wizarding War, and appeared to be close enough. They also appeared on Potterwatch together during the last year of the war. He was also a friend of Alastor Moody. They fought together in many battles, until Moody was killed by Voldemort in 1997, during the Battle of the Seven Potters. Remus was devastated, as were many other members of the Order. He must have been also a friend of Elphias Doge, Sturgis Podmore, Hestia Jones, Emmeline Vance, Dedalus Diggle and Mundungus Fletcher, as they were all members of the Advance Guard. It is also possible that he was a friend of Arabella Figg, as Dumbledore once told Sirius Black "to call Remus Lupin, Arabella Figg... the old company...". Remus was one of the many members of the Order of the Phoenix killed during Second Wizarding War. The name "Remus" comes from the brothers Romulus and Remus, the legendary brothers who fought to the death over the control of Rome, having been raised by a mother wolf whose cubs had died. Because of this, some fans speculated that Remus had a brother, but "Romulus" is merely the code name used by Lupin for Potterwatch. Remus's intense rivalry with Romulus indicates Lupin's ongoing struggle with his other side, the werewolf. "Lupin" is derived from "lupinus", Latin for "wolf-like"; "lupus", or "wolf", being the basic word. Canis l​upus is the scientific name for the wolf - to be described as "lupine" means to "resemble a wolf." Lupin is also the name of an plant with edible seeds. Rowling wrote a full-length biography of Remus for Prisoner of Azkaban on Pottermore, which was released in the final instalment of the book, and provided information on his and Nymphadora Tonks's relationship, as well as his youth. 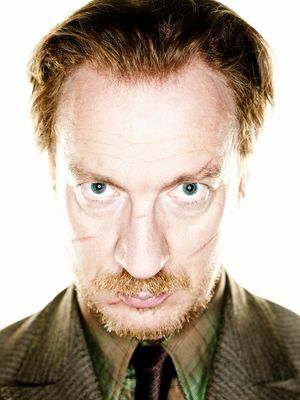 Remus is portrayed by British actor David Thewlis in the film adaptations of Harry Potter and the Prisoner of Azkaban, Order of the Phoenix, Half-Blood Prince and Deathly Hallows: Part 1 and Part 2. Thewlis had originally auditioned for the part of Professor Quirinus Quirrell, but Ian Hart was eventually cast. In the books, Remus plays a relatively large part in Harry's life after he left Hogwarts as Defence Against the Dark Arts teacher. However, in the films, Remus plays a large part in Prisoner of Azkaban, and then his role is drastically reduced. His argument and brief falling out with Harry in Deathly Hallows is cut out, as is his bitterness at being a father. The audience is not made aware of Remus' child until a throwaway line in Deathly Hallows: Part 2. Half-Blood Prince also cuts down his role, eliminating Remus's concerns about being in a relationship with Tonks. Overall, Remus is one of the most underused characters in the film series. David Thewlis was disappointed about his smaller appearances in the films, expressing a desire to be more involved. Originally, Remus and Nymphadora were supposed to survive the Battle of Hogwarts, but Rowling eventually killed them off as compensation after sparing Arthur Weasley from the death he was originally intended to die in the fifth book. The Marauders write their names on the Marauder's Map in this order: Remus, Peter, Sirius and James. Ironically, this, when reversed, is the order in which they die, James being the first in 1981, Godric's Hollow; Sirius in 1996, Department of Mysteries; Peter in March 1998, Malfoy Manor; Remus in May 1998, Hogwarts School of Witchcraft and Wizardry. The witch who pushes the lunch trolley, Remus, and Horace Slughorn are the only adults ever to be seen travelling to Hogwarts on the school train in the book series (the latter is never shown on the train in the films). Though the conductor is never shown in the books, he is seen in some of the video game adaptations. With his marriage to Nymphadora Tonks, Remus became related through his wife to the Malfoys, the Blacks, the Lestranges, the Weasleys, the Potters, the Longbottoms, and other pure-blood families. It was predicted by many fans that Wormtail would kill Remus with his silver hand, as Remus is a werewolf. However, J.K. Rowling mentioned in an interview that, contrary to what is seen in films, in her view werewolves are not affected by silver. Ironically the Marauder that does die by the silver hand is not Lupin, but Wormtail himself. In the film version of Harry Potter and the Half-Blood Prince', Remus and Nymphadora were already in a relationship, rather then Remus initially rejecting her feelings. Remus survived the longest out of all the Marauders, beating Wormtail by some chapters in Harry Potter and the Deathly Hallows. After the Battle of the Seven Potters, 13 people (Mr. and Mrs. Weasley, Bill, Fleur, Fred, George, Ron, Ginny, Harry, Hermione, Remus, Tonks and Hagrid) gathered in The Burrow to mourn the death of Alastor Moody. Afterwards, Remus stood up and offered to look for Moody's dead body. Later in the Battle of Hogwarts, Remus was killed by Antonin Dolohov thus making another of Trelawney's predictions come true for the third time (first time on Albus Dumbledore, and second on Sirius Black) : that when thirteen dine together, the first to rise will be the first to die. However, as it is not known when Remus died, it is possible that Fred died before him. His name is the inspiration for the wizard rock bands Remus and the Lupins and The Remus Lupins. According to StarDate Online's Moon Phase Calculator, Remus' birth date (10 March, 1960), fell two days before a full moon. Remus Lupin is unique among the teachers as he calls students per their names, not surnames. The only other teachers that are known to do this is the Headmaster Albus Dumbledore and the Care of Magical Creatures professor. Remus Lupin is the only Marauder to be on anything resembling civil terms with Severus Snape as adults. Sirius and Snape had often argued as adults. Pettigrew was treated with contempt by Snape, going so far into being treated as a house servant at Snape's personal residence at Spinner's End. David Thewlis has said that Prisoner of Azkaban director Alfonso Cuaron told him to portray Remus as a "gay junkie". Although Remus provides most of the books' information on the Patronus Charm, his own Patronus was never revealed in any of the books or media associated with the franchise until the release of the final chapters of Harry Potter and the Prisoner of Azkaban on Pottermore. His corporeal Patronus takes the form of a wolf, rather than a werewolf. Despite this, he normally preferred to purposely cast it as a non-corporeal form, as he considered the corporeal form to be too much of a giveaway. J. K. Rowling has stated that Professor Lupin is the kind of teacher she wishes she had while she was a student. He is good-natured, kind, and able to extract the best in everyone — for example, in spotting Neville Longbottom's lack of confidence and helping him to overcome it by teaching him how to defeat the boggart. As such, Rowling has also stated that "Lupin's failing is he likes to be liked. That's where he slips up — he's been disliked so often he's always pleased to have friends so cuts them an awful lot of slack." This is why, for instance, despite disapproving of his friends' bullying of Severus Snape, he once tried to stop them but failed and never tried again. ↑ The Lupin family is known British. ↑ 5.0 5.1 5.2 5.3 5.4 5.5 5.6 5.7 Pottermore - New From J.K. Rowling: "Remus Lupin"
↑ Despite the lack of evidence most believe this prank happened in the Marauder's sixth year but the memories in chapter 33 of Deathly Hallows are presented in chronological order which puts this prank even before their fifth. This page was last edited on 1 July 2015, at 17:47. This text is available under the GNU FDL and may have been adapted from the Wikipedia article about Remus Lupin (history).